The young male falcon (Band 23 black / C blue) who fell from the nest box on Memorial Day weekend and luckily landed safely on the parking deck returned to Kalamazoo on Saturday June 11, 2016. He made a strong and long flight out of his carrier demonstrating his successful rehabilitation and flying skills. Rebecca and the rest of the crowd were uncharacteristically not in sight on his release. 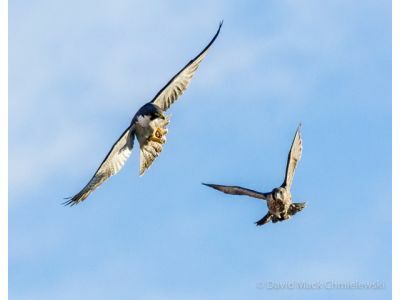 However, within a short period of time, the rest of the falcon family drifted back to the area of the 5/3 Building and parking deck. The parents flew around the youngster who was on the roof of the School of Medicine and were then joined by his little brother. The rehabbed falcon flew with his mother Rebecca back toward the parking deck and circled around with another strong flight and opted to land back on the Medical School. Since the birds are not in the nest box, we have discontinued the live stream function. The real time viewing with 5 second refresh will continue for the nest box and parapet cams (and will work better without the live stream taking so much band width).